The global cruise ship orderbook has reached another new record, following July ship orders from Seabourn, Princess, TUI and Lindblad. The newbuild contracts pushed the forward-looking orderbook to 113 ships set to be introduced between now and 2027. Supply growth has also reached new levels, as large ships ordered from Princess and TUI have sent the number of berths on the orderbook to record levels as well, with 268,854 additional cruise ship berths set to enter service. >> Download the orderbook as a PDF. This makes the average new ship size 2,379 guests, pulled down by over 30 expedition ships set to be introduced between 2018 and 2024. While Seabourn ordered two expedition ships, and Lindblad picked up an option for one expedition vessel, the TUI and Princess newbuilds are considerably larger. Both brands are set to introduce new prototype platforms with Fincantieri. TUI’s pair of newbuilds from the Italian yard will join the fleet in 2024 and 2026, respectively. The new ships will run on LNG fuel and have capacity for 4,000 guests at 161,000 tons. In addition, TUI Cruises will take delivery of new ships from Meyer Turku in 2019 and 2023, pushing annual capacity to around 800,000 guests, well up from an estimated 500,000 this year, according to the 2018-2019 Cruise Industry News Annual Report. Princess Cruises follows in a similar pattern, with a pair of LNG-powered vessels with delivery dates in 2023 and 2025. The Princess ships will be bigger, however, with capacity for 4,300 guests at 175,000 tons. Before that, Princess will take delivery of three newbuilds from Fincantieri in 2019, 2020 and 2022, built on the Royal Princess platform with capacity for 3,600 guests. 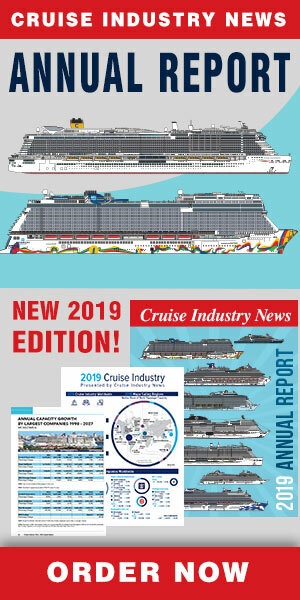 The current value of the orderbook is estimated to be $67 billion, per Cruise Industry News estimates. Compared to previous numbers, the month of March opened with a record 98 ships on order, which surged to 106 vessels a few weeks later, and 261,812 berths. Since then a number of ships have been delivered, but even more have been ordered, pushing the orderbook numbers up to new heights.